Having worked in the Reporting & Analytics space over the past 10 years across multiple sectors, Zahina has a wealth of knowledge and experience when it comes to how businesses utilise their HR data. A transformation specialist at heart, Zahina lives for change. After starting out as an Analyst at The Co-operative family of businesses, and working up the ladder before making a leap to Financial services 5 years ago, Zahina worked across the full HR Analytics spectrum: establishing operational reporting solutions, tactical delivery and driving strategic decision-making, as well as exploring new technologies and models to look at "what's going to happen?" as opposed to "what's happened?!" 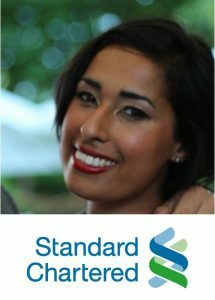 Zahina is a specialist in Stakeholder Management, ensuring clients are not just on the journey but also help steer the course and thoroughly enjoy collaborating to drive solutions. 10 Years. I started out as an MI Analyst at The Co-operative Group in Manchester before moving to London in 2013 joining HSBC supporting the Group Analytics piece, moved to head up the EMEA analytics space before switching across to the Transformation team to deliver the Analytics transformation as part of the wider HR Change agenda. I moved to Standard Chartered in April 2018. Ever since I graduated University back in 2006. I feel like it's one of the most progressive areas of HR but I don't always feel like as an industry it can keep up with its key enablers. For example, the different methodologies, data models and functions that can be leveraged are often pipe dreams for regular HR Analytics teams who are stuck in the mire of data quality and structural issues associated to organisations. Getting the basics locked down - for most of the organisations I have worked for, the business wants to run before they can walk. And as most of them are complex matrix organisations managed across multiple entities, jurisdictions and locations, the "who sits in my camp" question is the constant frustration when you are trying to build even basic predictors or leverage AI functionality. The other big challenge I see frequently is the uptake of self-service when it comes to the basics and appreciation of Analytics team as partners, not data monkeys churning out reports. Certainly AI. It's a huge opportunity to increase revenues by reducing commercial costs to businesses and actually leading real data-driven decisions. The reality of adoption in the next few years across HR services, not so sure - especially working in FS. The levels of governance involved in even basic decision making make it difficult to see a clear path. If we consider companies like Spotify, Netflix and Facebook who use it so well to support their consumers, we all benefit. The major challenge is the importance of getting a recommendation for the next Netflix binge vs. whether this is the right person to hire for my key leadership role...the risks are so much higher in HR and we need to figure out a balance. Certainly across the organisations. If we look at how marketing utilises data in most organisations, their visuals alone are light years ahead nearly 100% of the time. Our customers want holistic views of data, they don’t just want to know what their headcount forecast is but how will that impact the pipeline for all the products they want to launch? Will they be adequately resourced? And with the right skills? The benefits of managing analytics as a wider piece are huge and this is certainly why we are seeing the rise of the Chief Analytics Officer role, a logical evolution of the CDO. It also ensures that back-office functions are better associated with the commercial aspects of the businesses they support - for so many teams, the disassociation is far too great...they forget why they are there. On the market side, the AI and Machine Intelligence piece is booming and that can only continue to grow. The appetite for this is huge but the understanding of the capabilities and utilisation need work, especially when applying this kind of science to industries under major regulatory constraints. I think the role of Analytics specialists will also continue to evolve in line with how it has been moving over the past 10 years. It's no longer just about being good at crunching numbers. Getting the funding to really invest in Analytics functions requires a consultative approach with a real focus on stakeholder management and bringing people on the journey. And finally linked to that, the use of data scientists...nowhere near enough HR Analytics teams leverage these skills to full effect which is a real shame because this is where you really move the needle on real data-driven decision making. Be brave and challenge. If I had a penny for every single time I saw something that seemed inefficient or just plain odd, be that a process, a metric, a product; I would be happily swinging in a hammock on my private beach. When I first started out in this industry, there seemed to be ways of working that made no sense but being new to the industry and the role, I kept quiet....for a time! Confidence is obviously key but a fresh perspective is more important. I have so much appreciation for new team players who call out because it's a difficult thing to do but also because when you're in the mire, the best of us miss things or don't always see the wood for the trees. And another piece of advice would be to be hungry for knowledge, always. Never stop learning, never stop trying to learn and never assume you know it all. You definitely don't!